Artist Code: 1208. Completed September 2012. Life size water colour SOLD. Painted on Winsor & Newton 100% cotton rag heavyduty 460 gsm paper, size 565mm x 765mm (22” x 30”). This painting was sold to an overseas buyer (Florida,USA). It was removed from its frame and despatched to America mounted only. 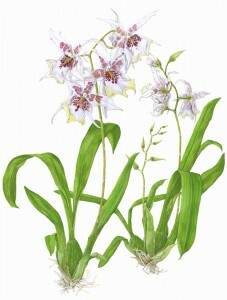 This painting was selected for the 2013 Society of Botanical Artists Exhibition, ‘The Language of Flowers’ and featured in the Exhibition Catalogue, Number 69. It was also featured on the SBA Website in Gallery 3. The Victorians, in ‘The Language of Flowers’, used Orchids to symbolize a respectful love for a delicate lady. My wonderful neighbour (who grows orchids and other exotic plants) came round on 28 July 2012 during my Cambridge Open Studios weekend bearing this beautiful orchid, and it took me two months to complete the portrayal. A Fifteen-hour, non-stop stint of drawing and composition produced a preliminary sketch. And 100 or so hours later the picture was completed. Usually the orchids are in a sorry state when I return them, but I am pleased to say that this one had actually grown a new shoot by the time it was returned to its cozy hot-house spot next door. A lasting bond to this effect.